I received a phone call a couple of weeks ago from a company in Knoxville, Tennessee that has its own fleet of box trucks and semi-tractor trailers. The owner told me that they have 12 locations throughout Knoxville and for many years they have spent tens of thousands of dollars on outdoor billboards. They found us online and learned more about our Traxx Framing System for their private fleet. Needless to say, we outfitted their entire fleet of box trucks and semi-tractor trailers! 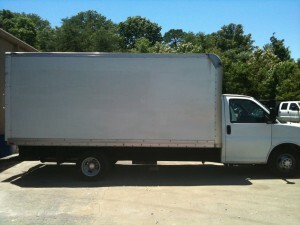 Here is what their box trucks currently look like, check back in two weeks for their new changeable look!